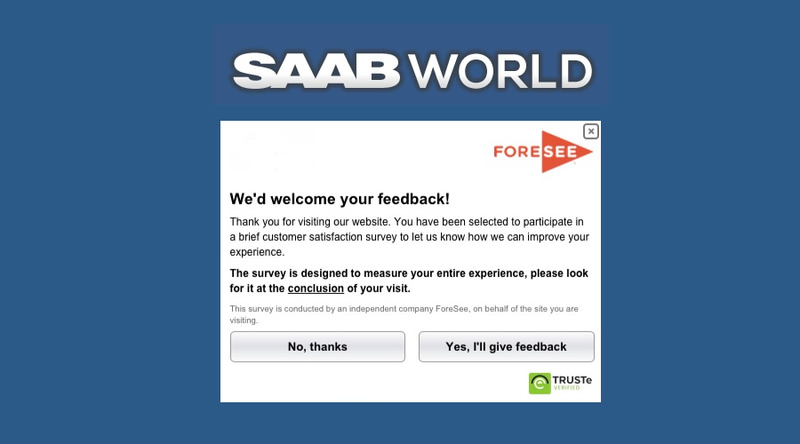 We’d welcome your feedback on SaabWorld! A lot of things happened at SaabWorld.org last year and we’re trying to make it better all the time. I am slowly moving articles, press releases, images and other content over from SaabWorld.net. The main reason is to provide a better user experience. The forum software is good for forums but not so good at other things. The main goal of Saabworld.org is to preserve Saab’s history, report on current and past events, bring Saab enthusiasts from all over the world together and most importantly to keep the Saab spirit alive. Press releases, brochures, images, articles by other SaabWorld members (thanks Dave T!) and much more. Even for such a small car maker, there is still so much content hidden in the dusty SaabWorld archives and beyond. Comments to SaabWorld articles linked on Facebook are now linked back to SW and the other way around. You can also still comment by using the form below the articles but these comments only post on SaabWorld. The sidebar has been removed from the single article pages. Too much information and distraction is bad so now it’s just the article content. More Saab, less clutter. The Downloads section currently has the Saabdocs files. I am thinking of moving all downloads like brochures, user manuals and other files from SaabWorld.net to .org as well. It will be nice and easy to have everything in one place and easy to access for everybody. So… what do you think of SaabWorld.org? Do you visit? What could be improved? Is something missing that you would like to see on the site? What kind of articles would you like to see? Any new features that should be added? Are there any Saab enthusiasts out there who would like to help with reporting on Saab events or write other articles? With the limited number of comments on articles, decreasing interest in Saab and the rise of social media, we sometimes wonder if we’re just wasting our time and there is not really a need for a site like SaabWorld anymore. We do this for fun and enjoy doing it but it can take a lot of time. I am sure we all get annoyed by those “Do you want to take a site survey” pop-ups you see on so many sites. I am not doing the same here but your feedback is really important. We are looking forward to your comments! Have been watching this website for a few years so at last I decided to register,I find it informative and interesting,I have had several Saabs,my first one was a 99 four door in White many years ago,then a White 900 hatchback another 99 four door but in Blue.Then my first 95 Estate in Red another Red 95 Estate car,after that a what we call over here in the UK a Dame Edna (DE)95 Aero Estate Auto, and currently I have another 95 Aero Estate Auto year 2000,its the oldest one I’ve had ,but its the best one so far. Jeff. Having thoroughly enjoyed owning and driving Saabs in the UK for 25 years, I guess I am what might be called an enthusiast for the brand. I thought I therefore knew a lot about Saab and its history, but also reckoned I was amongst a dwindling number of like-minded individuals. Not so! I believe SaabWorld is doing a fabulous job of providing some really interesting historical & technical information, much of which is new to me and fellow enthusiasts. Your work, I think, really helps keep the ‘spirit of Saab’ alive. Very well researched and presented articles which are a delight to read. Well done – keep it up, it is certainly appreciated! Nice but missing a category for the future with Nevs. ReCaptcha has been replaced with a question/answer solution for now so you should be able to register. Thanks for bringing this to my attention.